Earthenware press-moulded bowl with tab handle to top of thickened rim. Light brown glaze to interior of bowl and top part of exterior. Camberwell Sunday Market 20th May 2012. The story of Kerryl cannot be told without including Remued, or Preston Premier Pottery. The Man who began Kerryl was Allan Edgar James who was born in the Melbourne suburb of Preston on the 7th of October 1914 to John James and Edith (Roath). As a seventeen year old, Allen was reputed to have been riding his bicycle past the Remued Pottery when he was offered a job as a thrower by David Dee, (1877-1934) part owner with Reg Hawkins (1894-1971). Hawkins had migrated to Australia during the depression and had been a potter and decorator in England. Dee, born in Launceston along with his five brothers had been apprenticed by John Campbell in Launceston Tasmania and later worked at Hoffmans in Melbourne, Victoria before starting PPP. Premier Pottery in Preston was commenced by them in 1929. Both men had had much experience in pottery before beginning this small business by renting premises at 52 Oakover Road in Preston. Previously this site was used for curing bacon. This was a perfect location for opening a pottery as there was a large clay pit, virtually next door to the pottery. See my entry for Remued for a more complete story. 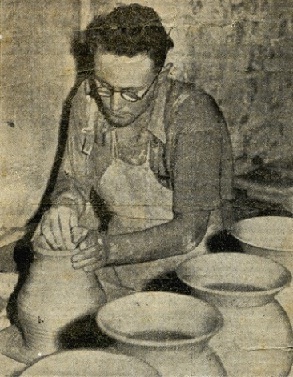 Allan was the only person to stay at the pottery during the Second World War. They had Army contracts, so someone had to make it. In 1946 Premier Pottery was back to the level of production it was at before the war but strong competition arose from cheap Japanese imported goods, hindering the success of Premier Pottery. This trend continued, ultimately forcing them to close their doors for good in 1956. They ceased production following, in part difficulties over the lease of the premises. Factors such as management and rental disputes, changes in the market place, and a decrease in sales, eventually led to their closure. Before this, in 1951-52 Allan set up a second small pottery operation using an electric kiln, not at Oakover Road but in the backyard of his home at 16 Esther St, Preston. It may be speculated that he was preparing to abandon Premier Pottery, which probably would have meant the end of Premier because the pottery revolved around him. Whatever transpired it is known that, about that time, his position at Premier changed from being an employee in a firm owned by Reg Hawkins to being a co-owner. Alan continued to work by day at Premier and worked evenings at home as well. Allan transferred production of 'A' Series items there. The series was extended with new shapes and new styles of glazing reflecting changing fashions. Slip-casting was introduced for some designs, replicating popular pieces from other potteries including Beswick, Shorter & Son and E.G.Greenway. Many familiar shapes from the Later Series also made a re-appearance in the Kerryl range, particularly after about number A88. The 'backyard' product, not surprisingly, bore a close similarity in style to contemporary Remued production from Oakover Road. A new numbering series was instigated, the 'A' Series, marketed alongside the Later Series through the same agents. Like the Later Series the 'A' Series started at number 1 but was distinguished by the prefix letter 'A'. Initially 'A' Series shapes were nearly all new, not repeating previous shapes. They included that favourite of 1950s potters, ramekins (numbered A1 & A2) plus lamp bases, dishes and vases. Kerryl Pottery, later operated from 53 Banbury Road Reservoir Victoria 1958 to 1980. 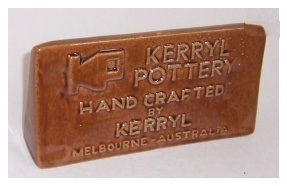 Incised “Kerryl” to base. The name may be derived from Margot Kerr who worked at Remued from the early 1930s and was responsible for introducing the now highly collectable gumleaf/gumnut design, although it is believed that it was named for Kerry, the son of Allan and Myrtle James. The "M" series may be named for Myrtle James, nee Fraser (1916-2007) wife of Allan. Allan died in Preston in 1979.